Life is better in a hammock! 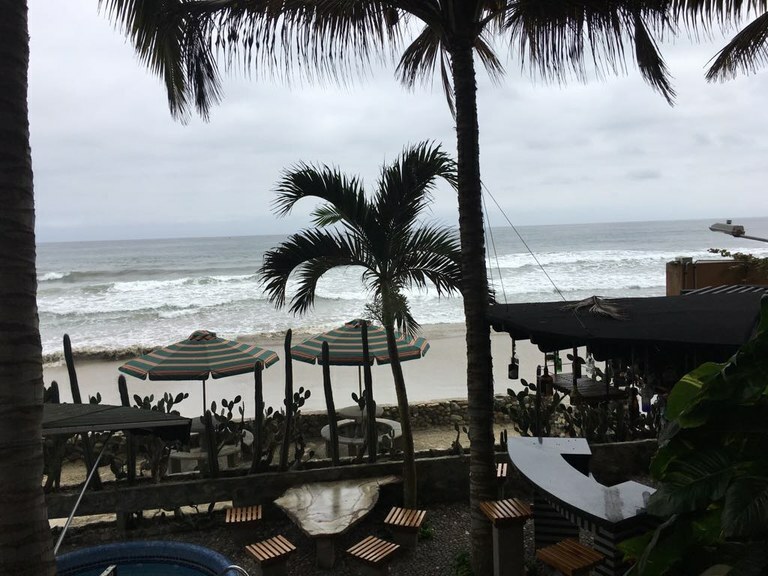 This is just what resort living feels like – Ecuador style!! 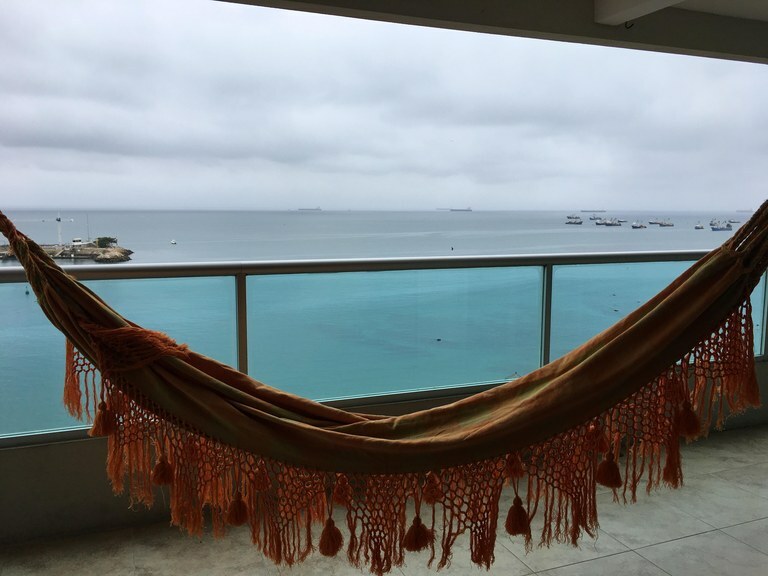 Just sit back and relax in your hammock while the breeze sways you as you watch the sunsets and listen to the ocean waves. This great condo is just over 1000 square feet of living space distributed into four bedrooms, three full bathrooms, and open concept kitchen/dining/living area. The best feature by far is the fantastic balcony which runs the whole length of the condo and can be accessed through the living room or two of the bedrooms. 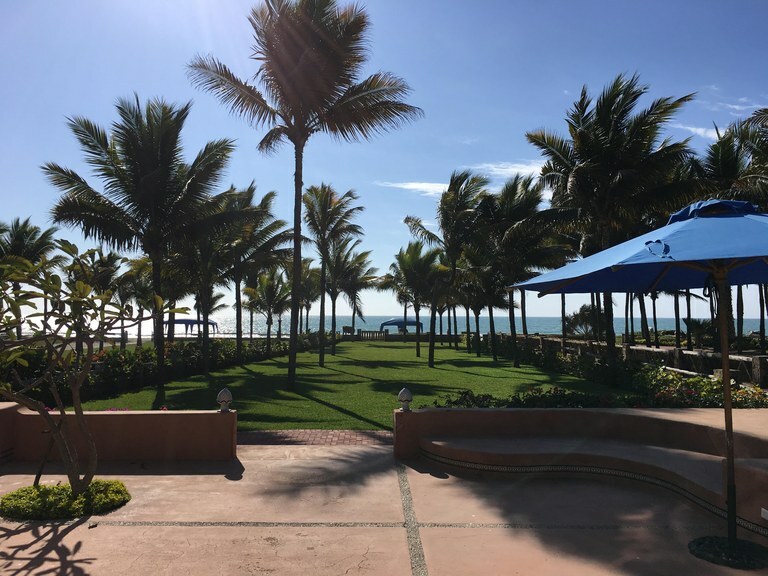 The complex is truly a resort in that it has a laundry facility, infinity pool, several Jacuzzis (one of which is salt water), multiple outdoor seating areas, children’s playground, game room, steam room, bbq area, rooftop terrace, and direct beach access. The monthly rate includes homeowners fees. All utilities are paid separately by the tenant. Year-long contract rate is $950/month. Higher rates apply for shorter term rentals. Please contact us for availability. Live like royalty in this condo just outside of Salinas. The views here are breathtaking and the amenities just cannot be beat. This is what you worked so hard for!! This great condo is just over 1000 square feet of living space distributed into four bedrooms, three full bathrooms, and open concept kitchen/dining/living area. 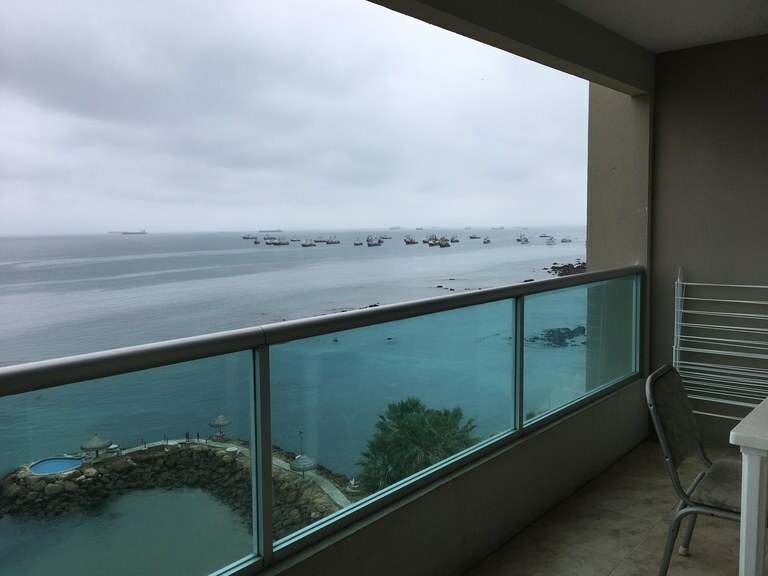 The best feature by far is the fantastic balcony which runs the whole length of the condo and can be accessed through the living room or two of the bedrooms. The complex is truly a resort in that it has a laundry facility, infinity pool, several Jacuzzis (one of which is salt water), multiple outdoor seating areas, children’s playground, game room, steam room, bbq area, rooftop terrace, and direct beach access. The monthly rate includes homeowners fees. All utilities are paid separately by the tenant. Year-long contract rate is $950/month. Higher rates apply for shorter term rentals. Please contact us for availability. *SOLD* Salinas Premier Building Investment Opportunity Fully Furnished 2 Bedroom Balcony Bargain!! **SOLD ~ VENDIDO OCT 2018** This unit is super comfy and located in the most sought after building in Salinas. New construction with modern design couple for a great investment at the beach. 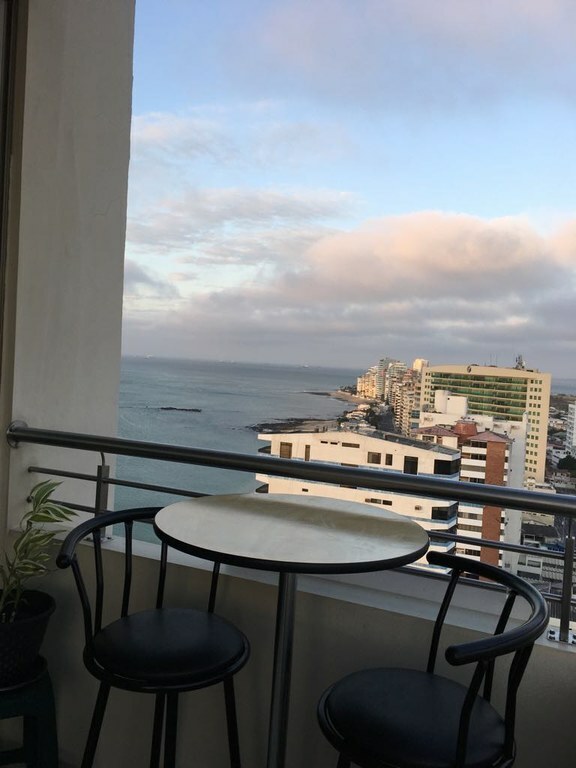 Located on the Malecón of Salinas within walking distance to all. Once you walk into the unit, you come into the spacious open layout of dining and living areas with open-concept kitchen with breakfast bar. The kitchen space has been designed to use every inch wisely and comes fully equipped with stove, fridge and a stackable washer/dryer off in the corner. The homeowners have installed surge protection throughout the whole condo as an added bonus. The two bedrooms are a good size, each with own closet space, ceiling fans, air conditioners and different views out to the ocean. The master bathroom has its own en-suite full bath and the other full bath is located conveniently in the hallway for guests. The living room leads out to the balcony where there is tons of space for storage, patio furniture, bbq grill and your bicycle. This premier building has 24 hour security, multiple pools, jacuzzy, steam room, sauna, gym, game room and back-up emergency generator. A pet friendly building. Unit comes with a parking spot and a storage unit in a neighboring facility behind the building. Being sold completely furnished including all furniture, appliances, air conditioners, kitchen items, etc. Fully turn-key. This large two-story ocean-front home is where you can tell your friends back home that you are truly living large. Imagine yourself grabbing a cocktail from the outdoor bar then slipping into the hot tub, or inviting friends over to barbecue and eat in the outdoor dining area, or just simply step outside your front door to the Pacific Ocean. All of this and more await you in this tropical paradise beach home. Surrounded by mature landscaping the oasis begins as you walk down the long driveway to the tree lined entrance flanked by a beautiful water fountain. Enter through to the home and immediately on the left you have a guest bedroom with full bathroom. Onto the right you have the entryway to the living room, separate dining room, kitchen, powder room, and laundry area. Head up the stairs and you will come upon a sitting area/study, as well as 2 other bedrooms each with their own bath for a maximum total sleeping occupancy of 10. The décor throughout the entire home is eclectic and artistic, with every area of the home showcasing the designer’s ideas: all novelties and unique to this property. The home is located on a property which shares a garden and outdoor bbq as well as beachfront access. 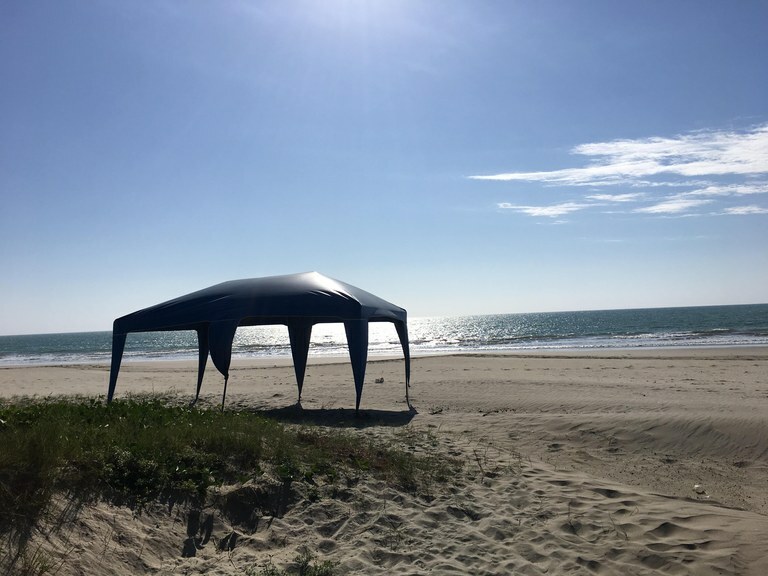 There is a nice sized pool, outdoor bar next to a hot tub, two separate covered dining/seating areas, outdoor brick oven for pizza, and direct access to the beach. There are three designated parking spots. The property has 24-hour caretakers and wifi throughout. Prices vary depending on length of stay: $5500/month; $3800/15 days; $2200/week. Holidays add on an additional 30%. 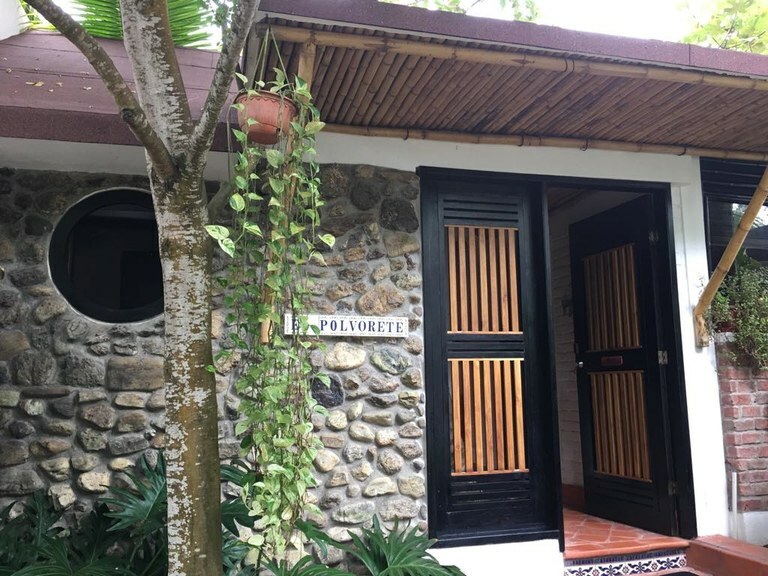 This is a unique cottage style home located inside an ocean-front gated property in a really nice beach village just north of Montañita. Brick, stone, tile and multiple varieties of local woods along with a tree smack dab in the middle lend to the great coziness you feel from the minute you walk through the front door. Ideal for a couple, this 2 bedroom, 1 full bath home has just about 850 square feet of interior living space plus a small balcony. There is a small dining area off the kitchen, and a functional living room. The master bedroom has an additional seating area and the second bedroom has bunk beds allowing for a maximum of 6 people. The home is located on a property which shares a garden and outdoor bbq as well as beach front access. There is one designated parking spot. The property has 24-hour caretakers and wifi throughout. Prices vary depending on length of stay: $2500/month; $1500/15 days; $720/week. Holidays add on an additional 30%. 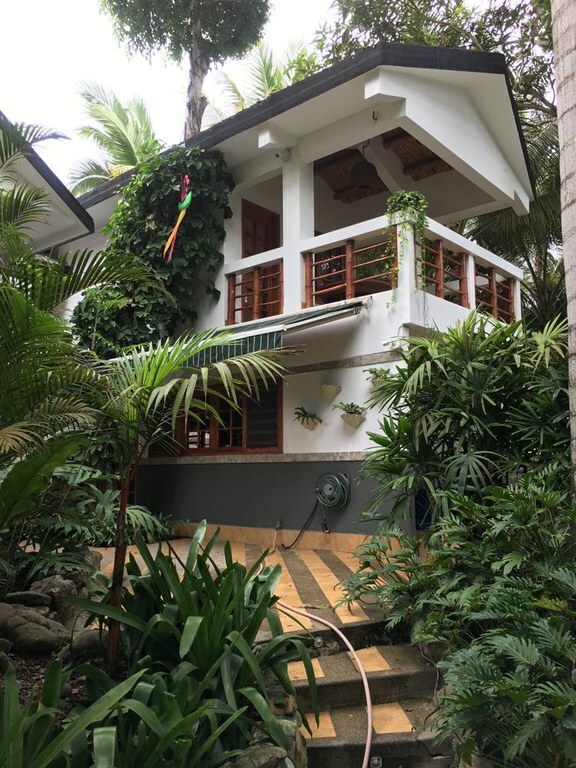 This is a unique two-story cottage style home located inside an ocean-front gated property in a really nice beach village just north of Montañita. Brick, stone, tile and multiple varieties of local woods along with a tree smack dab in the middle lend to the great coziness you feel from the minute you walk through the front door. Ideal for a couple, this 2 bedroom, 2 full bath home has just about 850 square feet of interior living space plus a nice sized covered balcony. There is a small dining area off the kitchen, followed by a functional living room. On the second floor is the master bedroom with balcony access and the second bedroom with bunk beds allowing for a total of maximum 4 people. 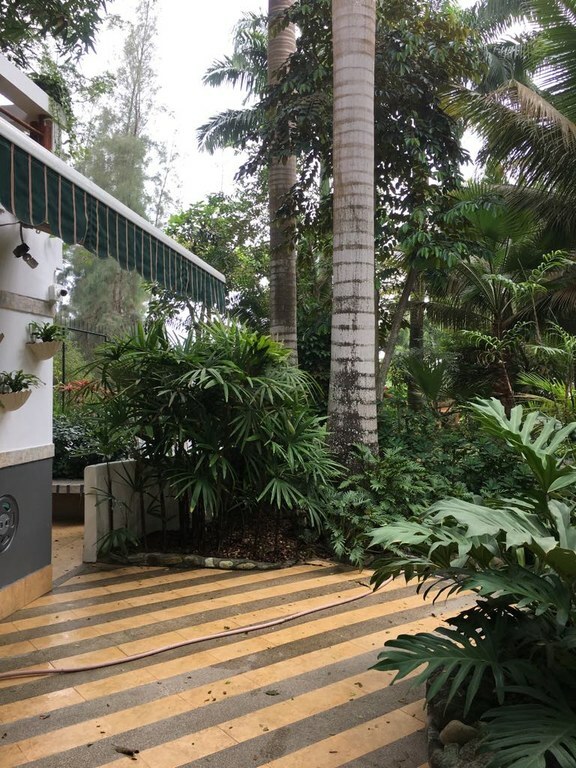 The home is located on a property which shares a garden and outdoor bbq as well as beach front access. There is one designated parking spot. The property has 24-hour caretakers and wifi throughout. Prices vary depending on length of stay: $2500/month; $1500/15 days; $720/week. Holidays add on an additional 30%. Come home to roost … literally! This is a unique cottage style home located inside an ocean-front gated property in a really nice beach village just north of Montañita. Brick, stone, tile and wood along with a tree smack dab in the middle lend to the great coziness you feel from the minute you walk through the front door. Ideal for a couple, this 2 bedroom, 2 bath home has just about 700 square feet of interior living space plus a nice terrace as well as small balcony. There is a separate dining room, small sunken living room and the kitchen albeit small is quite functional. The home is located on a property which shares a garden and outdoor bbq as well as beach front access. There is one designated parking spot. The property has 24-hour caretakers and wifi throughout. Prices vary depending on length of stay: $1000/month; $600/15 days; $400/week. Holidays add on an additional 30%. 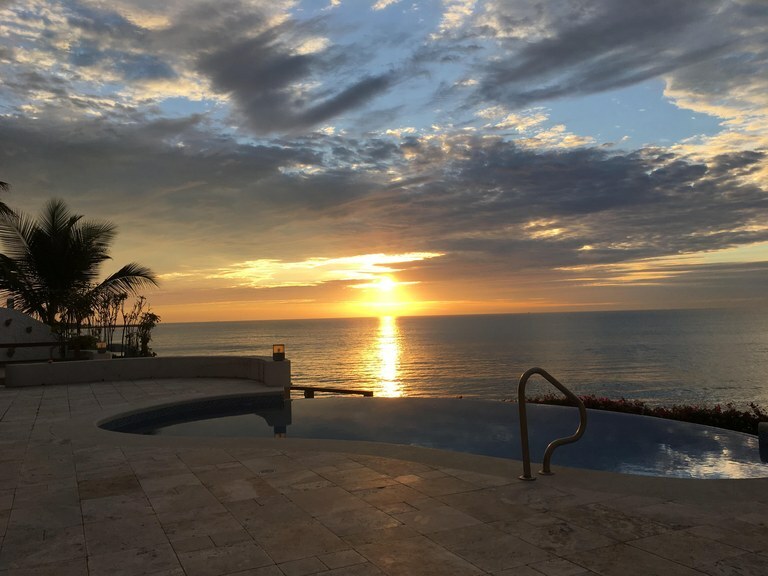 Become mesmerized by the sunsets in this luxurious ocean front Punta Blanca home. You will truly not want to leave here, so just take off your hat and stay a while. There is plenty of space for you and your family here so pack your bags and come see how the other half live in southern coastal Ecuador! This property is a gem, with a huge outdoor entertaining area surrounded by the single-story home. As you enter the property through the garage gate, there is parking enough for at least 10 vehicles. Enter the main residence through a grand doorway and you are overwhelmed by the height of the foyer and the views out to the ocean. Immediately to your left is a powder room, the laundry room (with outdoor patio for line drying should you choose) and kitchen access. Walk straight into the home to the sunken living room with fantastic artwork covering the walls and the exposed beam ceilings. Passing through the living room off to the left is a separate dining room from which the kitchen can be accessed. From the main entrance off to the right are located all the bedrooms: 4 large bedrooms each with own modern en-suite bath, air conditioning and closets. The beds can accommodate up to 10 people (two bedrooms have bunk beds). The best part about this property is the outdoor entertaining area. Passing through the living room’s sliding glass doors you enter onto the covered patio area boasting lots of covered seating and hammock space. There is a bar area off to the left. Walk down a couple of steps to the great infinity pool. There is a fire pit and a jacuzzy off to the right of the pool. Walk down more stairs to the wooden deck for more seating area as well as a stairwell which leads directly to the beach. There is an outdoor shower and bathroom off to the side. Punta Blanca is a very exclusive area where Ecuador’s rich and famous come to stay and play. The house is located very close to the Punta Blanca Yacht Club which functions mostly in season and offers a water park and restaurant. Punta Blanca is located all of 25 minutes north of Salinas; a great area for your luxury vacation. This luxury listing rents for $6,000/month in high season; $5,000/month in low season.